I’m fresh back from my latest tutored tasting/beer talk gig at Cheltenham Food and Drink Festival. I gave a talk on the theme of beers from the Westcountry – which for the purposes of my talk I defined as, Devon, Cornwall, Dorset and Somerset – partly by accident (I needed a title long before the talk was written or prepared) but also because I wanted to challenge the perception that the West of England is just about cider! It was a bit of a tough challenge with all those Somerset orchards that cider-makers get their ingredients from, but I did discover that hops were grown across the region (or at least in areas of Devon, Cornwall and Dorset – as well as in Wiltshire) back in the 1700s but by the late 1870s (not long after the peak of British hop growing in terms of acreage) they were pretty much gone. There is still a little small scale hop growing out west – the Eden Project in Cornwall has grown some and used them in a beer brewed by Sharp’s and a man on Dartmoor grows a few – most recently used in a beer from Dartmoor Brewery, but it seems conditions here and perhaps the lack of labour that saw the demise of commercial growing in the 19th Century mean there is nothing on a larger scale. 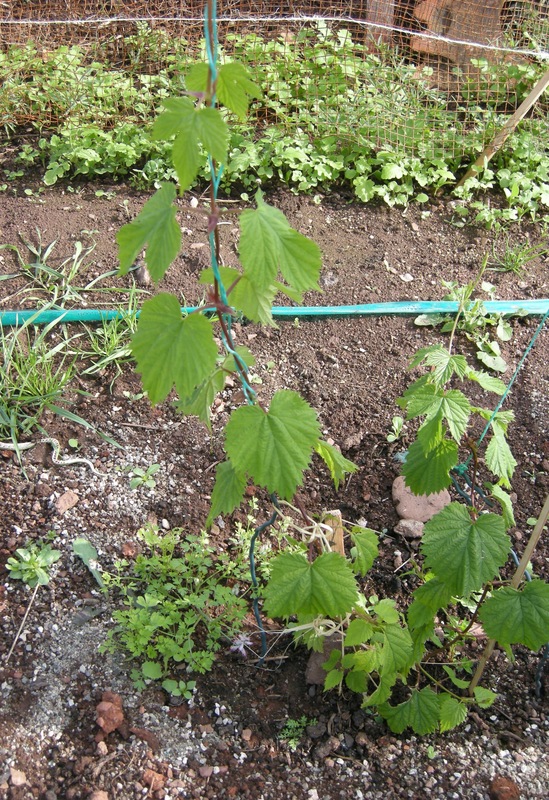 Hops growing in Devon (planted by Beer Husband on our allotment). Luckily the Westcountry is quite famous for being suitable for growing barley. Farms form across the region send enough grain to Tucker’s Maltings in Newton Abbot, Devon to make 16 million pints of beer every year. The maltings is one of only four traditional floor maltings left in England, processing barley in the same way it did when Tucker’s moved to Newton Abbot more than 100 years ago. So with the ability to produce some hops – albeit just a few (I include the ones Beer Husband and I are trying to grow on our allotment!) – a reputation for great barley, a historic maltings and going on for 100 breweries, I think it is more than fair to argue that the West is Beer Country! 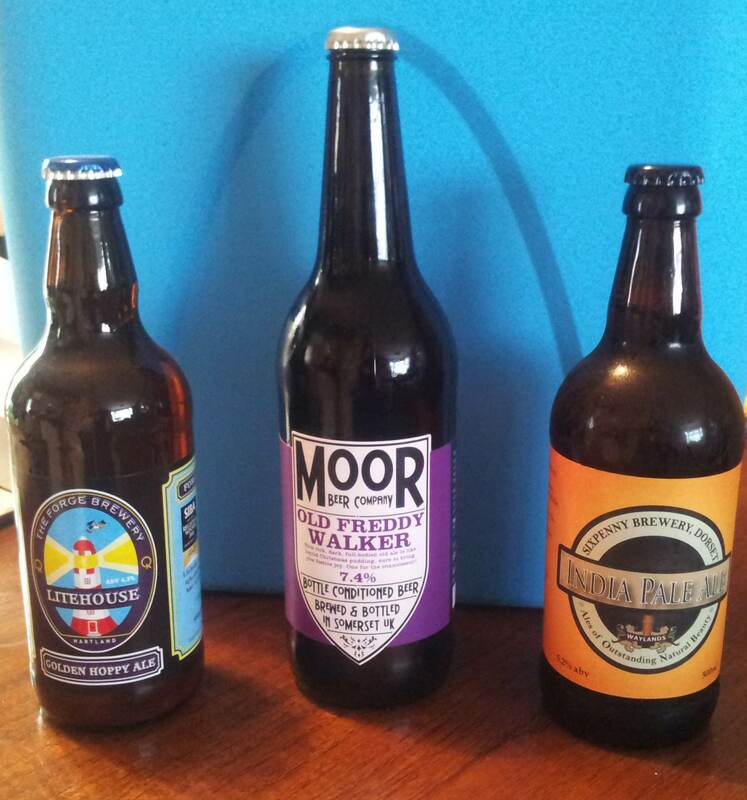 Best of the West: beers from Forge Brewery, Moor Beer and Sixpenny Brewery. Below you’ll find details of the beers featured at my tasting at Cheltenham Food & Drink Festival today. Unfortunately due to circumstances beyond my control I was unable to bring a beer from Cornwall but I have listed the one I would have brought. I selected these beers deliberately to show off the best the West has to offer. Forge Brewery is in Hartland, North Devon. It’s the only brewery to have won the SIBA South West beer competition, held each April at Tucker’s Maltings, three years in a row (with different beers). Litehouse is one of those winning beers and one of the best beers to come out of Devon. It is also a great beer to pair with spicy or lemon chicken dishes. Look: Sunshine gold. Smell: Floral, honey, clover flowers. Taste: Softly bitter with delicate citrus notes and a pleasantly cerealy aftertaste. I realised the first time I had this beer that it was EXPLETIVELY good and had brewer Scott Wayland not given me some to take away I would have cried all the way home because I’d had to drive to the brewery. If you’re in Dorset make sure you pay a visit to the brewery which is not far from a somewhat older Dorset brewery (Hall & Woodhouse) in Blandford Forum. It’s also close to Cranborne Chase AONB. The brewery has its own bar known as the Sixpenny Tap where you can also buy beer to take away. Look: Pale bronze. Smell: grass clippings, melon and lychees. Taste: Hoppy! With a pronounced bitter finish leading to a subtly sweet, with elements of barley sugar and toffee apple, aftertaste. Moor beer was taken over by Californian Justin Hawke in 2007 but has been around since 1996. Like many of Justin’s other beers OFW is hugely award-winning and is considered by many to be a cult beer. It is an old ale brewed with a mixture of malts (pale, lager, crystal, wheat and black) and British hop Bramling Cross. Look: Black Smell: Treacle, rich fruit. Taste: Rich chocolate, fruitcake. From Cornwall: St Austell Clouded Yellow (4.8% ABV) – sadly I was unable to offer this at Cheltenham as my bottles went AWOL. A vanilla flavoured wheat beer invented on a whim by St Austell’s very creative Head Brewer Roger Ryman who brewed it and took a punt on entering it into a supermarket competition without mentioning it to the owners of the brewery – only to have it win and go on to be listed nationally. It is now one of the brewery’s regular bottled beers. The recipe includes vanilla and whole spices, so owes a little more to the Belgian tradition of wheat beers but never the less has a lot of German character to it as well (esp aroma). Look: Cloudy yellow like its name. Smell: Cloves and bananas Taste: Sweet and creamy with obvious vanilla flavour. With special thanks to all the breweries whose beer I featured and to Westcountry Ales for getting OFW to me! Previous Farmers and the countryside make our beer!